Mărimea acestei previzualizări: 800 × 589 pixeli. Alte rezoluții: 320 × 236 pixeli | 640 × 471 pixeli | 930 × 685 pixeli. 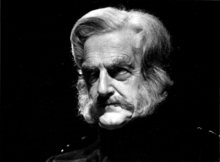 Cropped publicity photograph of British tenor Peter Pears in the Benjamin Britten opera Owen Wingrave. Dată Back of the photo says 1971, which is the year that the opera Owen Wingrave premiered. Sursă eBay listing of publicity photograph from NET Opera Theater on PBS, which broadcasts television programs in the United States. The photo has no copyright markings on it as can be seen in the full version of front and back linked above.